Waterloo Region is connected by a series of urban and rural trails that are enjoyed by walkers, hikers, joggers, cyclists, mountain bikers and even cross country skiers. 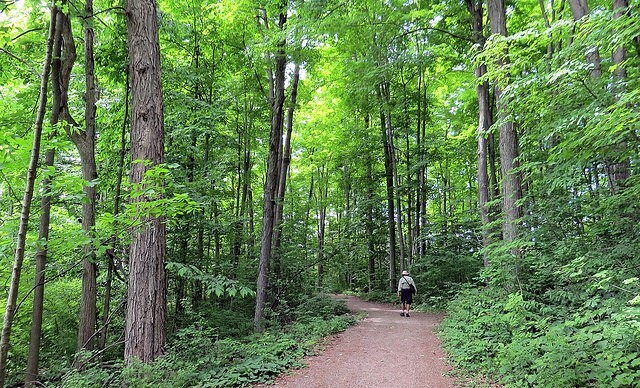 Whether you’re looking for leisurely paths that meander into city parks and past historic sites, or trails that wind their way through scenic countrysides and forests, there’s a route for you to explore in Waterloo Region. Choose your starting point, and get ready to enjoy some time in the beautiful outdoors! The City of Cambridge has more than 50 km of natural and urban trails, including some which run along the Speed and Grand Rivers. Favourite trails include the Cambridge to Paris Rail Trail, an 18 km graveled path overlooking the Grand River that is great for cyclists and hikers, and the Devil’s Creek Trail that runs through sensitive wetlands and is perfect for nature lovers. Kitchener offers more than 125 km of trails that provide continuous and linked routes throughout the city. Walkers, joggers and cyclists can explore every corner of the city on these community trails. Among them is the Iron Horse Trail, part of the Trans Canada Trail, which provides a scenic and historic route linking the cities of Kitchener and Waterloo along a former railway corridor. Huron Natural Area also features a number of different trails that can be enjoyed by hikers, joggers, nature lovers and photographers. Waterloo’s trail network includes more than a dozen different trails that wind throughout the city, from Uptown Waterloo through parks, woodlands and more. The Walter Bean Trail is popular for walking, cycling, rollerblading and cross-country skiing, and runs close to the scenic Grand River. The Hydrocut Trails are considered to be one of the top mountain bike riding destinations in Ontario and are nationally recognized for its 25 km of continuous single-track trails. There are a number of trails in North Dumfries, most of which are owned and maintained by the Grand River Conservation Authority. The Dryden Tracht is a 3.2 km trail located near Ayr, ON, and is used for hiking, walking, trail running, and nature trips. Wilmot Township has almost 58 kilometers of existing trails, and has completed a Trails Master Plan to guide the development of additional trails. Existing trails include the Petersburg Crown Lands – 4 km of multi-use trails that are popular for hiking and cross-country skiing – and the Petersburg Regional Forest – a woodlot with approximately 25 km of single track mountain biking/hiking trails as well as multi-use trails. The AvonTrail, a footpath that joins the Thames Valley and Grand Valley Trails, also makes its way through Wilmot Township. Woolwich Township has 10 public trails totalling more than 80 kilometres that are used for walking, running, cycling, cross country skiing and snowmobiling where allowed. A popular trail is the Kissing Bridge Trailway, a 45-kilometre trail through rural communities and wetlands. A quick detour off the trailway takes you to the West Montrose Kissing Bridge, the last covered bridge in Ontario. The Trans Canada Trail also links on to several existing trails in Woolwich Township, including the Kissing Bridge Trailway, Mill Race Trail, and the Health Valley Trail, as well as some newly constructed sections along Farmers’ Market Road in St. Jacobs. The Township of Wellesley is developing and expanding walking, hiking, and biking trails in the Township. The Active Transportation and Trails Committee is currently working with the township in the development of a recreational trail network. 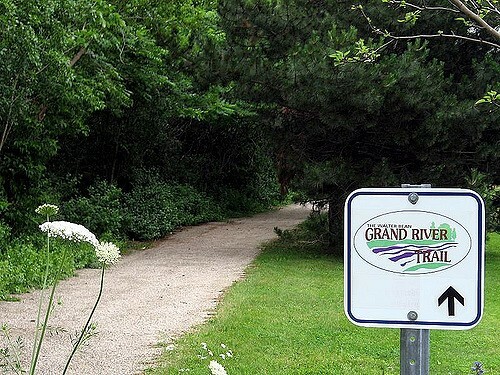 The Grand Valley Trails Association (GVTA) is a volunteer organization committed to building and maintaining hiking trails in the Grand River Valley, and promotes healthy living through outdoor activities such as hiking, snowshoeing, and cross-country skiing. To find out about upcoming hikes and events happening on Grand Valley Trails, click here. The St. Jacobs and Aberfoyle Model Railway is a model railway showcasing southern Ontario in the 1950s.